Sue has been busy with feral jobs! At the Council yard in Perth 9 cats have been caught & 2 have been returned so far. In Pitlochry a kind gent called Morris, who Sue has known for years, has an ongoing cat problem caused by neighbours not neutering their cats – the cats have their kittens on the straw bales on the farm next door & the kittens eventually go to Morris for food. The kittens are all tabbies this time & Morris has kindly offered to have some back once they have been neutered. 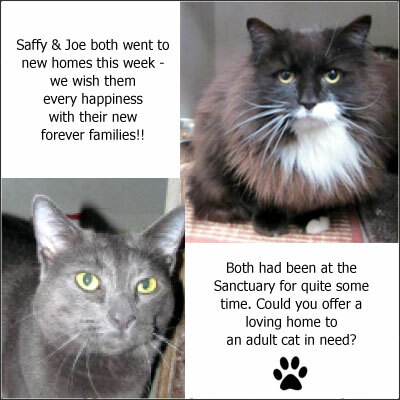 Two lucky cats have been homed this week – Joe & Saffy J An SOS went out for a foster home for an old cat found near Lochmill. A lovely lady, Hazel, from Falkland is now fostering her. The cat, now called Millie, was in a sorry state & weighed only 2kg when she was found, basically starving. After just 1 week of TLC she is now 2.1kg & doing well, she will stay under the care of our vet. Thanks go to everyone who has donated fruit; and to the volunteers who have put in extra hours in our shops to allow Sue time to do her feral jobs.